September 23, 2014, 10:39 AM · It had so much promise. A brand new theme park built in an area that already played host to about 15 million visitors annually, and that did not have a major theme park for hundreds of miles. It had a community in its corner and legions of potential customers bringing billions of dollars every year to spend. It had an untested-but-unique theme, a well-known brand, and a creative team with miles of talent, many of whom would later work on the likes of Universal’s Harry Potter and many Disney projects. After only one year of operation, so much promise turned into so much disappointment. A bad economy hampered tourist spending and killed the stock market. Poor pricing and marketing campaigns kept many customers either away or unaware of the park’s existence. Bad business deals led to lack of operating funds. With no money at the end of the season, no major company backing the park, and a frozen credit market, there was nothing left to weather the financial storm, and it was over. Subsequent attempts to rebrand and reopen the park were mired in bankruptcy court and lawsuits over previously abandoned intellectual property. In 2010 the brand new park was shuttered for good, relegated to SBNO status just two years into its existence. 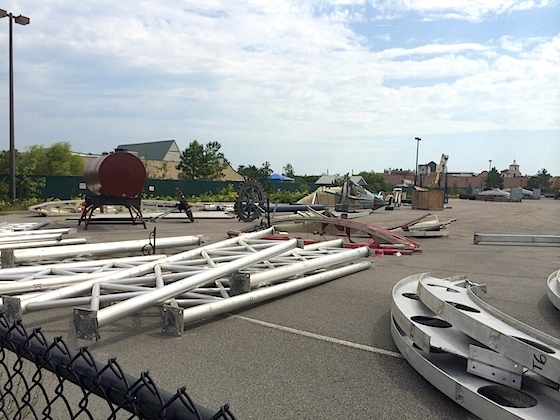 Today, the B&M coaster formerly known as Led Zeppelin and then Time Machine now sits in pieces in the cracked and overgrown parking lot, reportedly sold along with the other flagship rides to a park in Asia. The construction cranes currently at work dismantling the rides are a final reminder to those who pass by of its failed promise. It really is a rather depressing sight, considering what was once there and what could have been. The reasons for Hard Rock’s demise have more to do with economics and business and very little to do with creativity and design. The park was financed and built for less than $400 million, quite a feat considering the cost for infrastructure and the content they produced. I was fortunate enough to pay Hard Rock a visit on its very last day of operation in 2008. What I remember most about it was the quality and the little bit of edge that it had to it. It truly was a theme park, reminiscent of a not yet fully grown IOA. Some of the attractions were still fillers, and it needed a few years to mature and grow, but it had the bones of something great. Nights in White Satin remains to this day one of my favorite dark rides ever, and the park was full of neat visuals and ambience. The shows were entertaining, the staff was great, and the food was of good quality. The biggest thing missing from the day was the people. Makes me wonder what would have been if the creative team had a couple of years and money to play with. We can blame two things for that…the recession and poor business. Management took a gamble and made a grave error in judgment. Highly confident in their product to say the least, they overpromised to investors and under-delivered to their bottom line, spending more than $100 million of the $385 million budget on finance costs and investor payoff and leaving the park highly leveraged with little cash to operate with. They sorely misjudged their marketplace with the ticket pricing. Anyone over 3 years old was charged the full price of $50, and that was about it. No starlight options, pricing for height, senior prices, discounts for locals…etc. While much of this pricing in the industry is somewhat of an illusion anyway, the lack of options and perceived value likely would have put off many of the Midwestern middle class families of 5 with little kids…in other words the largest demographic that visits the area. Perhaps the biggest misstep of all was the largely ineffective marketing campaign. The seven-city tour of the Magical Mystery Bus didn’t work because they didn’t really advertise the stop and concert that came with it. The free interactive preview center built at the park site hosted an underwhelming amount of people when compared to the tourist population, mostly because not many knew it existed. The center was never really marketed to the visitors in town, and when the park opened, management amazingly made almost no attempt to partner with any of the more than 450 hotels in the area in the park’s marketing, something that every other major attraction in the area does. By the time they had gotten wise to some of their errors, the season was almost over and the money was gone. The bad economy encouraged most of their investors to simply take a loss and leave the project. In the wake of its initial bankruptcy, Hard Rock left scores of local businesses holding the bag, a bad taste that still remains to this day in the mouths of some. Out of the disaster of the first season came a group of former park employees to buy what was left. Having to abandon the Hard Rock name and the rights to specific band names and songs, the park reopened the following year as Freestyle Music Park. Soon after though, the park was mired in lawsuits from previous executives, seeking ownership of intellectual property and hobbling any attempts at a meaningful comeback. 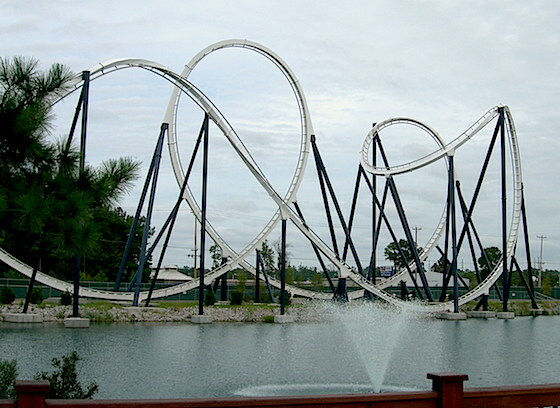 The park subsequently entered foreclosure, and then made one final appearance in pop culture on an episode of NBC’s “Revolution” as an abandoned theme park. As the rides finally leave the site and the weeds continue to grow, people in the area can’t help but wonder what’s next. Inquiries about park hours continue to come in. 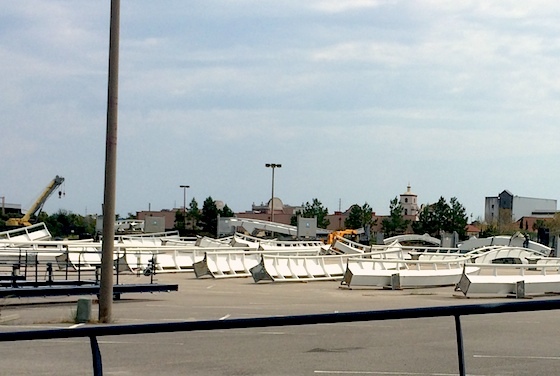 Many people lament the passing of Hard Rock when they see the finality of the dismantled rides in the lot. The park industry in one of the largest tourist markets in the country still consists of a small seaside amusement park, a couple of small water parks, and collections of flat rides in a few places…not indicative at all of its potential. As of yet, there are no plans to redevelop or rehab the area, although people seem to be calling for something to happen. It seems that one of the most unfortunate industry stories in recent memory has finally come to a close. 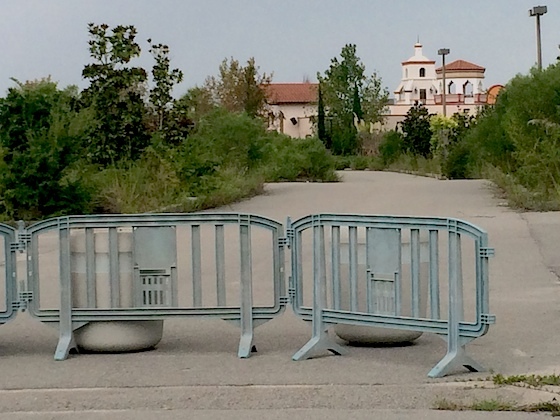 More, from the Editor: Theme Park Insider readers saw trouble with Hard Rock Park two years before its opening. Here are the links where we picked apart Hard Rock Park's overly optimistic attendance projections, the park management shot back at us, and then we analyzed the park's failure, after the fact. Hard Rock Park; bad concept or bad location? September 23, 2014 at 11:54 AM · I got the chance to follow this park from groundbreaking to debut, but never had a chance to visit again before its demise. It was such a great concept that was built in near record time in an extremely efficient manner (many of the existing outlet mall buildings were utilized in the park). Despite a really tight budget, it did not appear that the creative talent cut a lot of corners to deliver a comprehensive theme park experience, not just a glorified Six Flags. This should be a case study in how hard it is to create a successful theme park from scratch. It seems so easy on Roller Coaster Tycoon, but it can be extremely difficult in the real world, even if you put the best people on the job. It's really sad that investors did not recognize the unrealistic goals the designers set for the park, because those investors would have seen the need to provide funding for a few years of park operations to allow them to establish a foothold and begin to grow the brand. As a huge fan of Shark Tank, I wonder what would happen if this concept were pitched to the Sharks today, and if they would see past the lofty goals to infuse such an innovative concept with the needed cash to turn a profit. I still get looks from time to time when I wear my Led Zeppelin: The Ride shirt in theme parks around the country, and even had a brief discussion with an IOA employee who worked at Hard Rock Park and mourned its loss. It just goes to show that the business world can be very cruel to even the most innovative and amazing ideas. September 23, 2014 at 12:34 PM · I thought this was a great location and idea. Put a theme park near a well-known and highly visited vacation area and you are in Business. Very surprised to see it closed so soon after opening. September 23, 2014 at 12:59 PM · Hard Rock Park joins Old Chicago in the "Doomed Before They Opened" category. September 23, 2014 at 6:26 PM · I still remember sitting down to plan a Rao Family Vacation to Hard Rock Park, and then putting if off thinking we could go "in a few years when the kids are taller". I still regret that decision. Thanks for the article, Derek, and for the reminder that "waiting for next year" is not always the best option. September 24, 2014 at 8:16 AM · In May 2008 I was driving down I-95 and stopped in the South Carolina visitor center and saw the attractions display. There were brochures for Hard Rock Park and I thought that this looked great. Next year on my driving trip north, I'll take a side trip and visit this park. OOPS! September 25, 2014 at 7:07 AM · I interviewed with their management to be the original VP of Marketing. It was very apparent that the top management had a clear vision for the property but had no idea how to market an attraction. One of their ideas was to "tell" all of the condo and hotel properties who rely on the same families coming back year after year, that they could not book their room/property renewal without buying passes to the park. I told them that no property manager would do that and certainly would not do it to jeoparadize their rentals. When I asked what compensation or partnership fee those properties would realize for that envisioning a few dollars per ticket - meaning I could not envision a property manager risking a full rental for $30 or so (figuring $5 per a family of 6), I was told "they will just have to do it as we are going to be the biggest thing to ever happen in MB. The next day I told them I was not interested in the job! Again, they have an incredibly exciting concept, a fairly solid long term vision, a shoe string budget, but no marketing concept which is ultimately why this failed. September 26, 2014 at 7:37 AM · I took my grandson here shortly after it opened. Nearly half of the rides were not running which made the wait at the other rides too long. A man doing magic tricks asked for a tip and lamented how little he was being paid. Having paid a lot of money to get in we tried to make the best of it but it was a huge disappointment for both of us. Seems they were more interested in selling autographed guitars than running the park. We went back to the hotel and enjoyed the lazy river. When an 8 year old would rather do that than be at an amusement park, there is a problem. I hope South Carolina will someday try again. September 26, 2014 at 4:51 PM · The other mistake was the closing of the pavilion amusement park because the owners thought they would be able to compete, even after 50 years. I didn't go when it was hard rock but did when it was freestyle and it was ok but just not enough attractions for the price, and we got heavily discounted tickets. The pavilion was better because it was right at the beach but with this park you had to travel away from the beach. September 27, 2014 at 9:53 AM · Looks like the perfect place for a casino. Someone should contact Harrahs, they would foot all the bills and bring employment, shows, sporting events, their own security and many other extras plus revenue to local and state economies.